I watched THE WOMAN IN BLACK (2012) on 1.30.15. It was my first viewing of the film. THE WOMAN IN BLACK is a careful, thoughtful film. A PG-13 horror flick, it uses subtle scares mixed with jump scares with a heavy dose of ambiance. In fact, it is that tireless dedication to ambiance that ultimately hurts the experience. Because, unfortunately, THE WOMAN IN BLACK is also an entirely humorless and joyless movie experience. The oxymoron that is the modern horror film is that we are asking a movie to entertain us through terror. We want to be scared by the experience, and that terror (for those who enjoy horror film) is a cathartic and fun time. It is not so surprising, then, that horror films usually contain a fair amount of humor. Certainly Kubrick with THE SHINING, the ultimate movie in terms of horror ambiance, knows we need to break the tension here and there with humor, even if it is a dark brand of humor. THE WOMAN IN BLACK never lets up. Set in the early 20th century in a small English town, Arthur Kipps (Daniel Radcliffe) is a young widower who is in danger of losing his job at the law firm. He is assigned to go through paperwork in a house, the ultimate Macguffin in terms of actual film value. The town hates the house, thinking its occupant has caused the death of children in the village for years. It’s unclear why those people don’t just move out of town due to the epidemic in child death, but they don’t. The movie, then, is a gray and gloomy movie about children being tempted into suicide by the ghost of the woman in black. There isn’t much levity there, and the movie has no desire to let you off the hook. We witness the suicide of no less than five children through the course of the film. But, for all that danger, large sections of this film involve Kipps alone in the house chasing shadows. The problem from a film audience perspective is that we know there is no real danger when we are only half-way through a film in which the central character is alone in a ghost house. All the jump scares in the world can’t mask the fact that we aren’t about to lose our hero at this point. The movie’s climax is little more effective when it adds Kipps new friend Sam (Ciaran Hinds). But by that point, there is no way around the fact that this movie is just not any fun. There is a place in the world for dark horror. 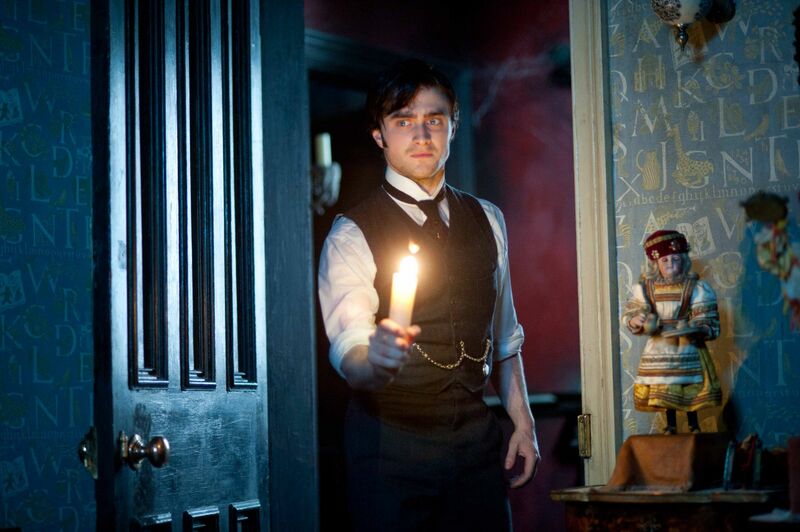 But the problem with WOMAN IN BLACK is that it just doesn’t do enough to earn being that kind of movie. We spend the movie sunk into our seat, arms crossed, maybe getting jumpy once or twice due to some effective horror moments, but we are ultimately unmoved. The acting is quality, particularly from Radcliffe in the quiet moments, but the performances are not good enough to pull this movie out of its own funk. The ending, too, is entirely unnecessary. I suppose it is possible to understand why they did what they did, but I couldn’t disagree with the implications more. It’s a falsely joyful button on a joyless film. It’s fun, but that’s pretty much it. Nothing more than another okay horror flick. Good review John. Yeah, I didn’t even really have much fun with it. But to each their own! As a scary movie I thought this one was pretty good. Maybe I was just in the mood for it. Creeped me out – a lot.